All over the news and media this evening are reports that, supposedly, the North-Korean dictator, Kim Jong-un, now requires all male citizens to replicate his infamous hair cut. So let’s find out how you too can look like you mean business whilst promenading through Hoeryong. For the cut, you really want to keep those sides cropped short and gradient up to a mushroom cloud top; however it’s probably best avoiding the phrase mushroom cloud when used in context with North Korea. Using the Schwarzcopf Live Colour XXL Black, you want to follow the instructions carefully to ensure you get that perfect shade of malevolent black. 1. With your freshly washed hair, towel dry until just damp and then use 3 or 4 pumps of Aveda Phomoliant mousse; this will help to define shape and give a light hold whilst drying. 2. Using a large paddle brush and a hair dryer set to high heat, medium speed, begin to brush backwards through the hair, in all directions; brushing all the hair back-left, then back-centre, then back-right. Once the hair starts to dry, firmly brush three segments into the hair as pictured: right, left, centre; although something tells me he concentrates much more on the right. 3. When brushed back with the rough shape of the hair in place, shake a small amount of Fudge Elevate Styling Powder onto the top of the hair to ensure total volume, then, use a small amount of Hairbond Distorter, rub into the finger ends and comb through in the direction of the three segments created. 4. Once you’ve pushed your hair back in these 3 directions, use a little more product at fringe and gently move the hair out sideways from the centre segment to create macho curtains that show you mean business. Finally, take a smaller segment from each of the left and right curtains and bring them a little further down onto the forehead to look more windswept and interesting; rub through with remaining product to create more defined points. 5. Finally use a light misting of Fudge Skyscraper hairspray to lock-in the style; my hairspray of choice to ensure your hair stays in place whilst burning and torturing dissidents. This article first appeared on MANFACE written by Thom Watson. It was published on Wednesday 26th March 2014 and was last updated on Monday 3rd April 2017 at 2:08pm. It's categorised under Editorials where you'll find more related content. While I usually enjoy reading your blog, I wanted to express my concern about this article. 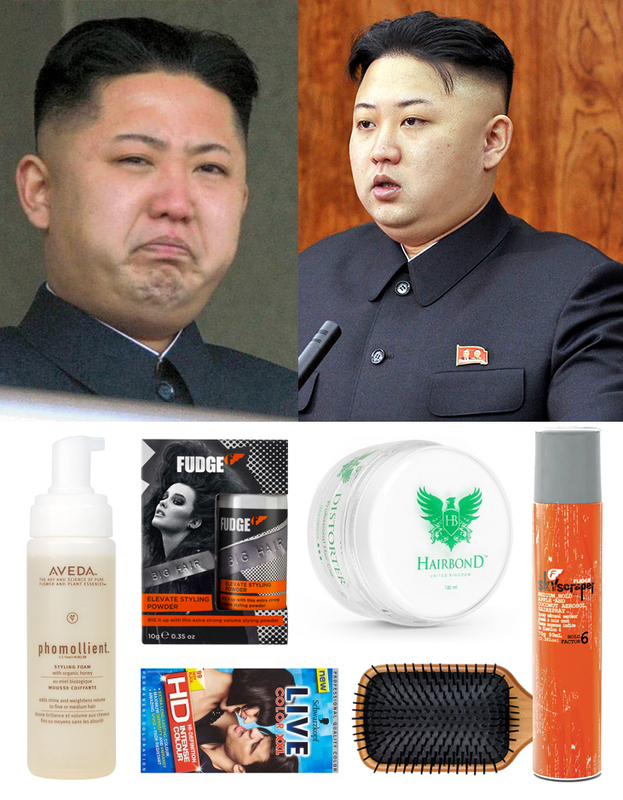 I don’t think it is appropriate to feature Kim Jong-Un, the head of one of the worst dictatorships left in this world in an article about hair styles. The UN just published an extensive report on the human rights violations in North Korea last month (http://www.thestar.com/news/world/2014/03/02/the_indispensible_guide_to_north_koreas_atrocities.html). Anyway, let me state again how much I usually love your blog and the good work that you are doing. The whole point of this satirical article is to show how ridiculous and laughable this man is and that he isn’t someone to be feared but to be ridiculed. Only when you can begin to laugh at your fears can they stop becoming fears. I did however, realise that it might cause some controversy; the article is tongue in cheek and was intended to provoke but not upset.